I had no idea that sour dough didn’t use yeast. 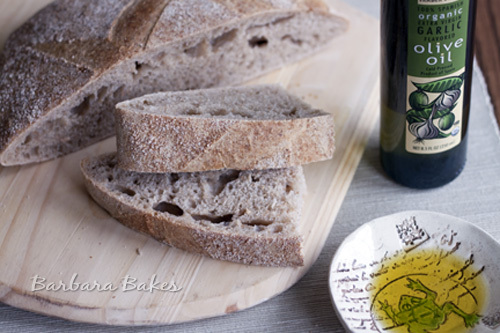 It’s probably my favorite bread, too – I will have to try this out! Your loaf may not be super-tall, but it did have quite some rise to it! When I look at the before-baking picture, I expect a flat-bread, and it’s very far from flat–awesome job! Thanks for your kind visit to my blog! I came here when I saw your link, and am drooling over the wonderful images in your sidebar–your gorgeous cheesecake entremet is calling my name! 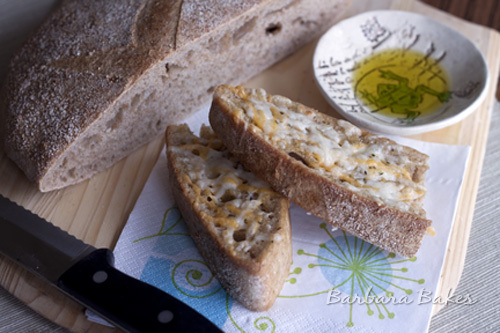 What a perfect combo – Shelby’s Blogiversary Cheesy-Garlic Bread with Daring Bakers Sourdough! 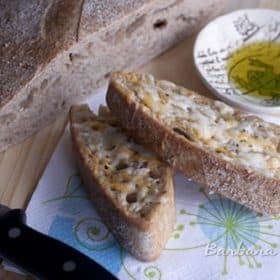 Your crumb is absolutely gorgeus – perfect, airy holes, and I can only imagine how great it is with the cheese and garlic toasted into it. Now, who inspires me besides you? 😉 OK, if it has to be someone living..Jacques Pepin, hands down. He’s the reason I cook and bake – the beginning of my love and preparation of all things food. A safe, happy and wonderful New Year to you and your family! GORGEOUS! and totally IRRESISTIBLE!! I am such a bread-aholic. Once again, you win my heart with absolute deliciousness! Learning to do a better job baking bread is at the top of my resolution list this year. There is nothing like a homemade loaf (when it isn’t heavy as lead). 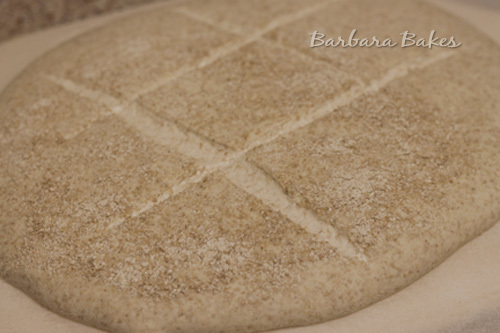 I’ve enjoyed all your posts this year, Barbara, and look forward to reading about what your are baking in 2012. Happy New Year to you and your family. I can imagine how good this bread smells while it’s baking. Congratulations to Shelby!